I’ve re-finished several pieces of furniture with the 4 most popular Homemade Chalk Paint Recipes. Through trial and error, I’ve discovered a few tips which make a BIG difference in DIY paint application and overall finish. If your chalk paint recipes are not meeting your expectations, or you’re about to mix your own DIY version for the very first time, here are few easy steps which will provide you with brand name chalk paint results. 1. When mixing your chalking ingredient with the paint of your choice, you can use eggshell, satin finish, or paint & primer all-in-one. I’ve tried them all and they all work. However, I achieved the flattest/chalky-est finish, with a FLAT latex paint. 2. **Important** The key to mixing a velvety smooth homemade chalk paint is getting your chalking ingredient as lump free as you can BEFORE mixing it into your water or paint. To achieve a lump free medium, you can vigorously mix it with a fork or whisk. You can also sift your ingredient through a sifter as you would flour or icing sugar. Another great method is to put it in a plastic bag and squish it between your fingers until you feel no lumps. 3. When measuring and mixing, I used the transparent container below. Using a clear plastic container makes measuring much easier. 4. After you’ve removed lumps from your chalking ingredient, start mixing your powder with water or directly into your paint depending on which recipe you’re using. To do this, I used an inexpensive $12 blender. 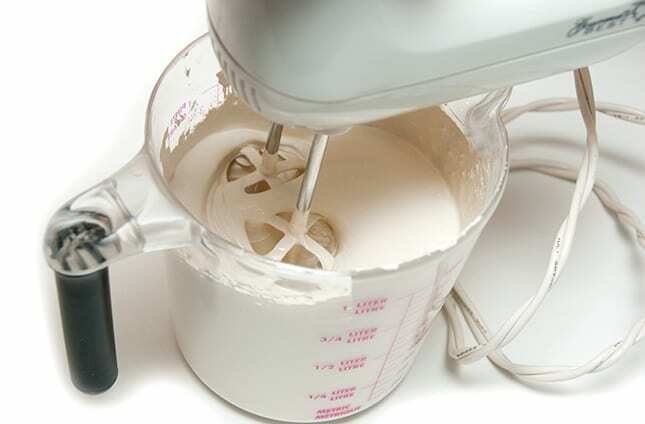 An old mixer or a drill with a mixing attachment would also work great. If you don’t have any of the above, use some good ol’ elbow grease….but make sure it’s as smooth as you can get it BEFORE you start painting your furniture. 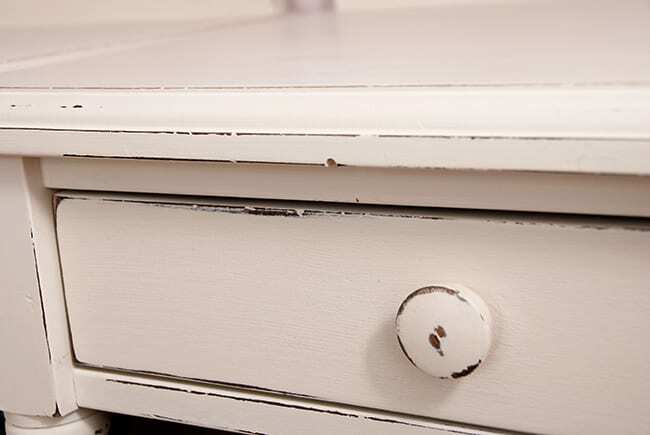 The smoother you can get it, the better your painted furniture will look. 1. Choose your brush or roller carefully. 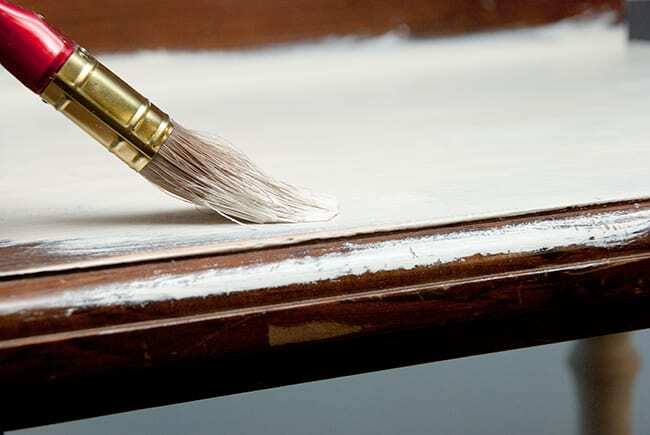 Depending on what type of finish you want, a cheaper brush can give you a dry brush or distressed look, while a good quality brush will give a smoother finish. Here I’ve used a cheap Dollar Store brush to achieve the distressed “country” look. 2. Homemade chalk paint adheres exactly as the brand name chalk paints. No sanding, stripping or priming is required. 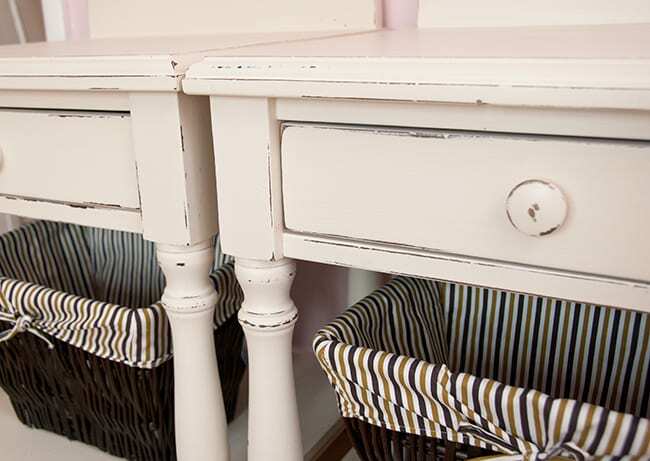 Give your furniture a good cleaning and then you’re ready to paint. 3. The chalking medium you choose does NOT determine the quality of coverage. The coverage is influenced by the brand of paint you use and how much water you add. 4. Keep a rag/paper towel close by in case you need to remove any grain or particles while painting. It’s so much easier to remove while the paint is still wet. 5. With any of the homemade chalk paint recipes, you can easily add water to thin your paint OR add more chalk ingredient to thicken your paint. 6. Mix as much paint as is required for your project at hand. It’s better to mix a fresh batch each time rather than leave the paint sitting for weeks. 1. Sanding with a fine grit sandpaper (220 to 400) works just fine. 2. If you’d like to achieve a distressed look, a coarser sandpaper (120 to 180) is required. Homemade chalk paint does NOT distress as easily as store bought and will not distress with a damp rag. 3. Seal and finish your furniture with a wax or poly top coat. If you’ve painted your furniture a white or a very light colour, wax would be the preferred choice as polyurethane may yellow over time. I like CeCe Caldwell’s Clear Wax. It’s very easy to work with and 100% all natural. 1. After opening your Plaster of Paris, Un-Sanded Grout, Calcium Carbonate or any other chalk paint medium, tightly secure the bag/container and store it in a cool dry place. This will ensure it doesn’t attract moisture and keep it in perfect condition for the next time you use it. 2. If you have any unused chalk paint, storing it in a glass container/jar rather than a plastic container will help keep your paint for future use. I did find making a new batch each time worked much better though. 3. When re-opening your chalk paint, hold your container on an angle. The dried chalk paint on the lid and container rim tends to crumble and fall into the fresh paint. I hope these tips have been helpful. If you have any tips & tricks you’ve discovered while painting with DIY chalk paint, please fill me in! If you have any questions about the Homemade Chalk Paint Recipes I’ve tried, don’t hesitate to ask below and I’ll get right back to you. Previous Post: « Free Husky HVLP Paint Gun Is On Route! Hello and thank you for the great information. I would like to paint a folding table with a slightly rough plastic top that I use as a sewing table. Will the CC chalk paint “self level” to fill in the rough texture smooth ing the surface out? Keep up the inspiration and thank you! I was wondering if anyone has had any issues when sanding your projects? For example I painted a wooden sign white., then I painted black words. When I sanded it down, the Black bleeds into the white . I have tried painting the white, letting it dry for 3 Days, sanding it and then painting the black lettering, letting it dry for a couple days and then sanding. It still bleeds into my white paint. It’s very frustrating . Just curious if anyone else has had this issue . Can/have you used diy chalk paint on leather? I have read that store bought gives good results, but nothing about the diy version. I need a special color. Hello Ash, I just viewed a YouTube video by Jamie Ray vintage and she discussed the same scenario with the black bleeding into the White. What she suggested is to seal the white afterpainting before stenciling black lettering to prevent the bleeding. Hi, Denise! 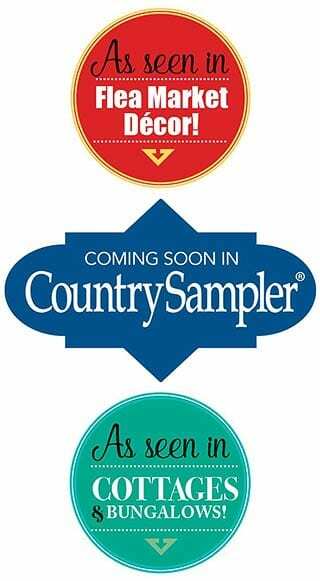 Would a flat enamel paint work well with the cc recipe? Hi Edith! Sure, so long as it’s waterbased and not oil! Hi Denise, Can I mix enough chalk paint to do three coats same day or do I have to mix each batch seperatly? You are the greatest of the websites! Hey there! I am new to this blog and I love it. Great information and easy to understand. I do have a question and I’m sure it’s answered somewhere in your blog but I couldn’t find it. Can you use Acrylic latex to make chalk paint using the POP? Thanks in advance! I really want to make washable, “green” type chalk paint – any ideas what else can be used as a base? Maybe slip? Can you use these homemade chalk recipies on a metal steamer trunk? Do you have to sand trunk prior to painting? Hi, Denise I love your site! I made a rookie mistake earlier… I sanded off soft wax on a cabinet and instead of my water spray bottle, I grabbed Orange Glo furniture oil. It didn’t affect the paint and looks OK but do you have any advice on how to reapply wax? I made my first batch of Chalk paint to redo my kitchen cabinets but noticed the color was not as bright. I used a latex Glidden “white on white” color and its not as bright when I made the batch vs what the regular color is. Is this normal? If I am wanting a brighter white should I try again? im usging the pop receipt. Hi Tonja! The above ingredients do not/should not change the color, however they DO change the sheen. Chalking ingredient turns the paint more chalky matte, therefore the light hits it very differently than say a satin or eggshell. After living with everything wood, light, dark, medium, I’m ready for a change. Rather then by all new pieces, I’m trying my hand at chalk painting. I have been a follower of you for quite some time and absolutely all your finished pieces. With that being said, I am not sure how to mix the paint. What do you mean by 2 part paint, 1 part CC. Something simple I’m sure, but my brain is like “what does that mean, how do you mix that”? I have the paint and have the CC, just not sure how to mix that. I’m quite excited to start and finish my first piece. Thank you in advance for your assistance. Hello and thank you for your help which I found on here. I have used the calcium carbonate recipe and have started a piece (a dining table). I have sanded it and have mixed and painted the mixture on the legs to date. My worry is that after a day I can still scratch the paint with my fingernail. Is this usual or do I just have a problem. Will it adhere after time or when I wax? Also the dark stain is bleeding through as slightly yellow so I am presuming I need a primer? Thank you for your help. Hi Diane. Unfortunately, if it’s scratching off after 24hrs, it will not adhere with time or wax. It sounds like a light sanding and a prime would be best for your dining table. Thank you Denise – I did actually light sand but will now prime and hope it then works 🙂 Your help is appreciated thank you. Pleasure and good luck. I’d love to hear how it all turns out for you. Hi Denise, how are you? Hope your Xmas was fantastic. Thanks for sharing this wonderful information, it is awesome. Thanks. Hi! I love your blog, the great tips & your gorgeous creations! I have found myself smiling while reading your segments 😀 … you’re very funny. Anywho, the problem I’ve been having with both the POP & CC recipes is brush marks. They are very noticible in some areas. I’ve used good, soft brushes, tried thicker/thinner paint. I don’t know what I’m doing wrong. Unless I sand between each coat with 320 or 400 grit sandpaper, it is “groovy” (not in a good way) with brush marks. Even sanding doesn’t eliminate the brush marks entirely, but it does help smooth them out enough to look finished. Any thoughts on this? Thank you! Denise, I’ve made plaster of paris chalk paint and will have to sand because it is rough. Have I not mixed it enough, is it supposed to be silky smooth? Actually, it is “painfully” rough 🙂 I’m still glad I made it but wonder if just flat latex would have sufficed for my little project, a small round table. What are the benefits of using chalk paint as compared to regular flat latex? Thanks for your help. 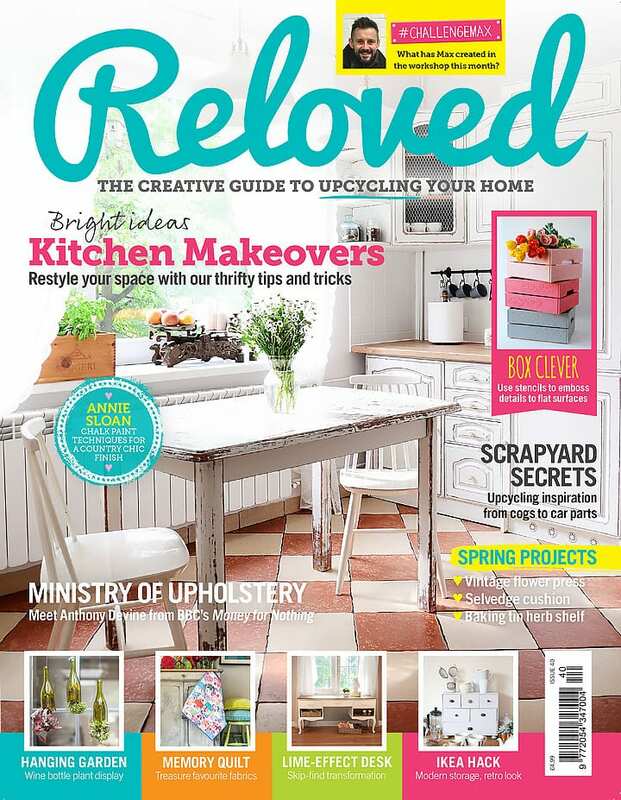 I love the decoupaged dresser top and plan to try my inexperienced hand at that!! You have me all fired up. Hi Denise- new to all this- can I use chalk paint on furniture that has been painted with what looks like vinyl matt paint or does it only work on pieces that have been polished or stained? I am a first time chalker 🙂 I made my own paint using plaster of paris, well…..first when applying the second coat, the first coat was coming off with my brush. I got a new more expensive brush and the second coat went on great. Now my dilemma is the wax. I tried to apply the wax and the paint is coming off when I use a brush or a cloth. There is no way I can rub the wax into the paint, it would strip all my paint off. I have googled several sites and nothing addresses my problem. What is happening!!!! Hi Denise! It sounds like your paint has not adhered (possibly because there was a shiny/glossy topcoat that would have benefited from a light sanding to create some ‘tooth’ for your paint to stick to) and when any sort of pressure is applied its coming off. My guess is the 2nd brush you used was much softer and wasn’t agitating the first coat – therefore it stayed on. Unfortunately, the best way to fix this is sand and start again so the paint adheres 100%. Hi Denise, I have a similar issue to the previous one in that I am in Italy and can’t find Plaster of Paris. Can I use plain wall plaster? Thanks for all the recipes…and the tips! I’m Barbara, from Mauritius Island. We receive here the Annie Sloane chalk paint. I never bought it, it’s too expensive… So I decided to try my DIY chalk paint. Here we can have : grout, baking soda. For the plaster, I think it is in specialised shop. However, I tried with crackfiller, ( Alabastine ). I don’t know if it is the best…So and so thick! It must be similar to the Grout, which is a joint filler. What receipt would be best on painting glass jars, vases etc.? My favorite is the Calcium Carbonate Kathy. Works really nicely on glass. I accidentally bought SW acrylic latex enamel all-purpose paint. It was expensive and I think it was the formulation that could give me the gorgeous teal & purples I chose. Now I’m concerned because of the “acrylic” and “enamel.” Can I make homemade chalk paint with it and would the chalk paint store well in a tightly closed glass jar? SW All Purpose will work great with these recipes Tammy. I’m a huge fan of SW and use their paints all the time. As for storing in a glass jar, I don’t. I prefer to mix the amount I need for the project at hand so I’m constantly working with a fresh batch. i have had big trouble mixing with the enamel. it lumps up and is unusable. I’m following directions to a t with the plaster of paris recipe. Has using the enamel worked for you? I am considering painting my guestroom walls using pop. Have you tried using hmcp on walls? I got the idea since I know chalk paint covers a lot of imperfections and while I have patched the nail holes, I thought I would get a better finished look using chalk paint. I like to use an eggshell or semigloss latex paint. To get the look of flat or chalk paint while keeping the durability of the eggshell or semigloss, I over roll the paint. The instructions say to not go over the wet paint after applying so it will make the shiney or semi shiney finish. I found that after applying, if you go over the wet paint one more time, it makes the surface finish dry flat rather than shiney. It still has the durability and washability (is that even a word? ☺ ) and has held up very well through my own children, day care kids and now grandkids. It also accepts being painted over very well, too. Great tips. Thank you! I am about make my first batch of chalk paint and was looking for tips. Yours are fantastic. Can’t wait – painting a big hutch, black and white with the chalky paint, distressing it. Ready, set, go! I’ve made several matches and every one comes out extremely gritty. I miss the pop and water first with a quick very well before adding the paint. I’m longing for the silky smooth finish all you bloggers talk about! Please help! What am I doing wrong? Thanks! I strained the lumps out using a strainer when pouring it into my sprayer so I don’t have any white speck – the entire finish turns white when i tried sanding. I’ll take your advice & mix up a new batch & this time I’ll follow your blog instructions (that I found after making my first batch lol) & strain the pop first & use a hand mixer etc to make sure its mixed thoroughly w/no lumps to have to strain & then be careful thinning it correctly this time. Should I mix the pop & water before aadding it to the paint? What type & finish latex do you like best? Especially if I’m going to use poly in the end for a glossy finish? I used flat/matte paint & primer thick 1-coat behr marquis latex the first batch but wondering if I should try satin or semi this time and if a thinner latex w/o primer would work better? Also, should I sand the rough paint before applying the new batch even though it turns white? And if so, what grit would you suggest? Hi. I didn’t read your blog before attempting my project. I wish I would have. So now I’m stuck with a dilemma. I didn’t mix my plaster of Paris well enough with the water and I have a lot of clumps that is on my project. I was going to sand it and apply another coat. Would you suggest anything different? Thanks. Thank you. What grit sandpaper do you suggest? 220 grit or higher works nicely. I really like using soft sanding sponges to knock down paint. I did some DIY chalk paint and applied it with a sprayer. It looks great, but if you touch it, it gets “dusty,” almost like I’m wiping away the plaster of paris I used. Thoughts? It wipes away with a damp cloth, but I’m wondering if I should just wax over it? Or should I wipe everything down and let it dry before I wax? A light sanding with a high grit sand paper should get any of the “dusty” paint off prior to top coating with wax or poly. Thanks for all your helpful advice! 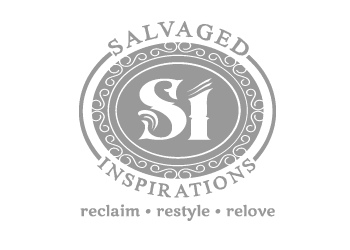 I’ve learned so much from you – yours is the best site I’ve found on using homemade chalk paint!! I’m having a similar problem with a dark gray homemade pop chalk paint I made. I cleaned, sanded & primed the thrift store table i rescued prior to spraying 2 coats of my chalk paint. It looks great but feels really rough. I tried sanding but it turned white when I sanded with my rotary sander & fine 250 grit paper so I stopped. It also turns white if it is touched or bumped. Is this normal? Will it be gray again after waxing or wiping with a damp cloth? If its not normal did I use too much plaster of Paris maybe? (I had to thin the mixture to spray it & added more pop when it was too runny). If that’s the problem is there anything i can do to fix it? I’m very experienced with painting furniture with regular paint but this is my first attempt at using chalk paint. I bought Sherwin Williams acrylic latex flat paint. When I mixed it with plaster of paris it became super thick. Is this the wrong kind of paint to use? SW is an excellent paint to use Helen. 🙂 Try adding a lttle less Plaster of Paris and mixing it with a little more water. These recipes are an excellent guideline but sometimes not exact as the water based paints can vary along with temp/humidity etc. I was delighted to discover your blog and the chalk painting info. Have you ever used a sprayer for chalk painting? I saw an ad recently for a small-projects sprayer in which chalk paints were specifically mentioned. Had some great reviews, just wondering whether you or your readers have used a sprayer. I chose the base color of a mid clay shade I wanted the finished item to be, but it has dried so much lighter after application of my POP chalk paint. Though it has gone on beautifully, it is is far from the shade I wanted.Have you any advice on choosing base shades please?Having used two coats already on the fabric of this chaise, so how many more can I apply to correct it without spoiling it altogether? Also how do you stop bleed through of stains when chalk painting fabric seats. I have read about clear shellac, but this doesn’t seem to be available in the UK?Any alternatives please? Hi – can I use acrylic craft paint for this? I have a question about making the chalk paint mix. I read some where that you should not use a paint with primer in it. That when you mix it up it will harden. Is this true. I w as planning on using a calcium carbonate mix with the paint. Thank you. Great thank you for replying In the middle of a project. I wanted to do a light white wash over a cranberry color., so it’s not so loud, but still getting the beautiful color coming through Its a an old mettle bed frame. I made my own chalk paint using CC and latex paint. I did two coats and let it dry 22 hours. I went to glaze it and the paint on some parts peeled off when I wiped the glaze off. Any idea why this happened or how I can fix the problem? I wiped down the furniture with a wet rag before painting but did not sand or prime before. Sara, it sounds like there may have been a slick/shiny topcoat interfering with the adhesion. Whether using brand name or diy chalk paints, shiny/glossy surfaces sometimes do benefit from a light sanding. Do you always use a flat paint? Will a semi gloss paint work as long as it is a water base paint? I prefer using a flat paint because it provides the most authentic brand name chalky finish. But yes, I have used a semi and it works fine… just not quite as matte. Is there an additive one can add to their homemade chalk paint to stop it from seperating in between use. Not that I’m aware of Max. A little water and a good mixing does the trick though. Thanks for all this, Denise. Can you just add a bit more about finishing? I will be doing old kitchen cabinets, and want to be able to wash them down easily without damaging the paint. 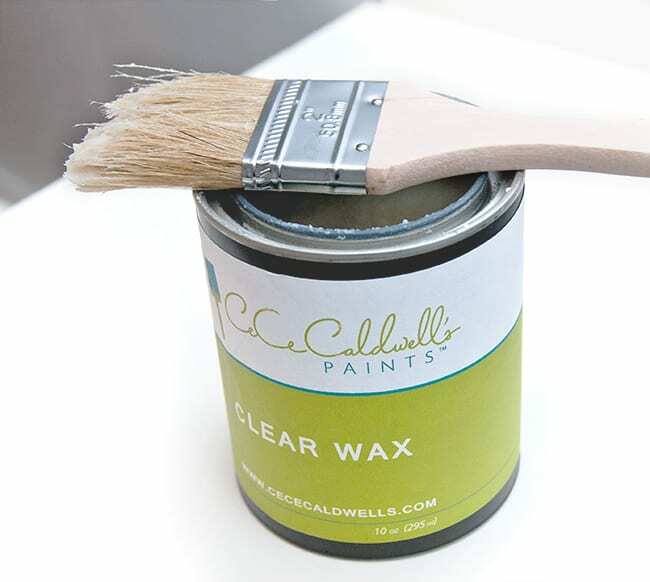 Typically, chalk paint is sealed with wax because it’s very porous and the wax absorbs beautifully. But for high traffic items, cabinets, tables etc, I prefer using a water based poly. A few of my favorites are Minwax Polycrylic, Varathane and General Finishes. All are available in a variety of sheens. I have been making my own chalk paint with plaster of Paris. I have found that the texture after the furniture dries is very rough. I expected the chalky look and feel but I don’t like it feeling like rough sandpaper. AM I doing something wrong? I have followed all your tips and made sure it was smooth when mixed. Do I have to sand it to get a smooth feel, but what if I don’t want the distressed look? Hi there Kristi! For a professional finish, I sand ALL my pieces. This includes pieces that have no distressing and also pieces I’ve used milk paint, enamel or brand name chalk paints on. A light sanding smooths out any brush strokes, uneven application, and it will surely knock off any gritty rough spots. A perfect example is when I used the baking soda recipe above. It was VERY gritty! However, after I lightly sanded, it looked and felt smooth as glass. Hi Denise, I have a big tin of satinwood paint would this be useable for homemade chalk paint? Great! I checked and it’s a paint with a satin sheen finish designed for wood and it says it’s water based so that’s good news. Thanks. I’ve been reading your recipes and tips which really help but how much water? I’m using plaster of paris and not sure of the consistency. Thanks for the evaluation of the different formulas. When adding the water (add in slowly and amount will vary with the amount of chalking ingredient used) aim for the consistency of a runny milkshake Barbara. Hi Denise, I have used CC diy chalk paint on many items in my home( now I’m addicted) and am collecting furniture to paint and sell. I find that I’m having to do 3 coats of paint to get good coverage. If I used a spray primer, would it possibly require less coats to cover? The pieces that have a lot of slats are so time consuming, and I’m trying to be more efficient. Yes, just as when using ‘regular’ latex primer does help.